Streck, C., Murray, B., Aquino, A., Durschinger, L., Estrada, M., Parker C., and Zeleke, A. 2015. “Financing Land Use Mitigation: A Practical Guide for Decision-Makers.” Prepared with support from cooperative agreement # S-LMAQM-13-CA-1128 with U.S. Department of State. 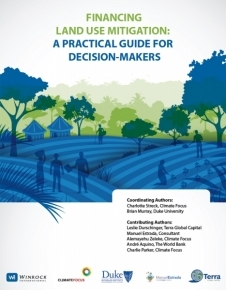 This report serves as a practical guide for those seeking finance to implement specific actions to reduce emissions from land use. It is intended to assist national policymakers and other decision-makers in accessing and leveraging financial mechanisms to support activities that reduce forest GHG emissions and increase forest carbon stocks.